The Bio-Fuel Propulsion Unit, to give its full title, has been with us for over 150 years. Not much has changed in that time and almost all small interstellar craft have one type or another of BFP unit fitted. Bio engines manufacture Bio Fuel as a by-product of use. Producing Fuel every 15 minutes and depositing it in your Fuel Tank. Once the Fuel tank is full any excess fuel produced is expelled in to space as waste. Depending on the model of the engine some come with an additional power boost. (See specs below). These can be very handy for those Captains living on the edge of their power usage. 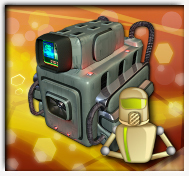 The Bio-Fuel Propulsion Unit range can ONLY be purchased through the Core-Exiles main Official Store. Once purchased, your new engine will be fitted by a member of Staff (G.M) as soon as humanly possible. Existing Engines are removed and deleted from your account. Please note there is NO Skill requirement or Level Lock on this item. IMPORTANT : When purchasing you MUST enter the intended Captains name for this Delivery. We will fit the engine to THAT Account. Bio fuel Per 15 mins : 30! Note: When changing ships, engines are transferred for you automatically. So you do not need more than one engine as this is moved to your current active ship at the time of changing ships.